Aljazeera is reporting clashes between US troops and Mahdi Army elements in East Baghdad early Friday morning, with some attendant deaths. The puritan Shiite Mahdi Army follows Shiite cleric Muqtada al-Sadr. Meanwhile, young Shiite nationalist cleric Muqtada al-Sadr began a campaign to get people to volunteer to rebuild the golden-domed Askariyah shrine in Samarra, and then to guard the refurbished building. The move has provoked fears that it will exacerbate sectarian tensions (Samarra is largely Sunni and a center of a vigorous guerrilla opposition to the new, Shiite-dominated government). Thousands of Sadr’s followers gathered in front of his offices in Najaf, pleading to be sent to samarra to protect the shrine. Shaikh Ahmad al-Saffar, who is close to grand ayatollahs like Ali Sistani, said that Iraq at the moment is unstable, and “we fear sectarian turmoil.” He called on Muqtada to postpone this campaign. In contrast, Sadrist leader Sahib al-Aamiri said that the Mahdi Army would be armed when it headed for Samarra, and would be under government protection, to which the government had already agreed. Al-Sharq al-Awsat/ AFP report that [Ar.] Muqtada al-Sadr has also frozen all the activities of the offices of the Martyr Sadr II movement for two weeks, renewable. 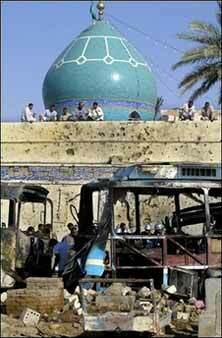 This move was intended to free up organizational capacity for the project of restoring the bombed shrine in Samarra. Scott Peterson of CSM gives some surprising reasons for which one young Shiite man joined the Mahdi Army. It is to protect the weak and do good– almost as though he were Clark Kent becoming Superman. Joshua Partlow and Saad Sarhan of the Washington Post report some sad details about Thursday’s events in Iraq. A few hours after the explosion, members of the Mahdi Army, a powerful Shiite militia controlled by cleric Moqtada al-Sadr, arrived at the scene and tried to cordon the area. A tense standoff ensued between the militia and local police, who fired their guns into the air. Eventually, the police left and the Mahdi Army remained. Kufa is admittedly Muqtada al-Sadr territory, and if the Mahdi Army could assert itself anywhere it would be there. But still, the incident is not a testimony to the ability of the police to stand their own against militias. Young rickshaw drivers who ferry pilgrims around Najaf, many of them orphaned boys, take their lives in their hands according to Reuters. At least 35 bodies turned up in various parts of Baghdad, about half of them in Dora, one of the most violent areas of the capital, police said. Eight more people died after two car bombs reduced several shops in the Washash market in western Baghdad to charred wreckage. Thirty five bodies!? And two car bombs? Wasn’t there supposed to be a US and Iraqi sweep of dangerous neighborhoods to stop car bombings and faith-based reprisal killings? The Maliki cabinet decided Thursday to ban political activity on Iraqi college campuses. Sunni-Shiite tensions are running high, and Sunni Arabs are afraid of reprisal killings against students or professors that Shiites charge were members of or sympathizers with the Baath Party. On the other hand, I’m not sure the decree is constitutional. If students and professors are of legal age to vote, how can you stop them from being engaged in politics? I think what could be banned is only violence or the immediate advocacy of it. I was watching al-Arabiya satellite television on Thursday afternoon, and they had a segment on the Iraqi economy. This channel tries to be supportive of the new government and the Americans. But they had to admit that the Iraqi stock market, which is very lightly capitalized and only has a couple of dozen companies, fell by five percent this week. An analyst named Tabatabai admitted that the reason was that major investors pulled out in light of the continuing bad security situation. We are always told here in the states that we should trust the wisdom of the market. Well, it isn’t saying that things are going well in Iraq. They cast around for at least some good news and reported on a glass factory that was doing good business. Then they admitted that some of it was replacing the windows that keep being blown out by the car bombings. A few years away. That is the estimation of a man who surely is champing at the bit for some Iraq oil contracts. A few years away. The market knows. Don’t miss this interview with Nir Rosen, who–unlike most American observers–knows Arabic fluently and has been on the ground all over Iraq. He is deeply disappointed by what journalists are not telling the US public about how bad it is there. He is also reconsidering whether for the Americans to just up and leave altogether would be the best thing for Iraqis at this point. See also Rosen’s important recent piece in Salon.com, “Did the invasion make things worse in Iraq?”. Tom Engelhardt is illuminating on the destabilization game, and has some comments on the recent tiff over Iraq of Rice and Lavrov.